(Stand Out) Here you see four adults with special needs in a MUVE dance work shop. This is an "All TRIANGLES MOVE" game. Three Triangles are marked on the floor. Each has a set of toys. At the Call "Move," players move as a team to the next Triangle. 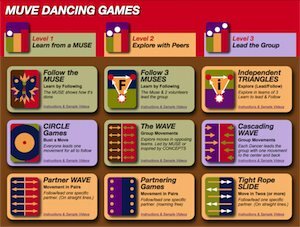 MUVE Dancing Games are easy to play, they are fun games for special needs children and adults. Old and young, children and parents can dance and exercise together! Learn how to play this game at the Dancing Game Page of the muve.com website. (Brother IZ) MUVE Dancing Game activities for special needs adults. This game is an "Independent TRIANGLES" game, where players inspire each other in groups of three. Adults with special needs, their parents and therapeutic aids can dance exercise together! No special dancing skills are needed. MUVE dancing workouts promote physical, creative and social skills. Following a lead dancer, as well as being a dance leader to others, teaches attentiveness and invites creative movement ideas. This is the first MUVE dancing workshop for this group.